Rivers State Governor, Nyesom Ezenwo Wike today held a Thanksgiving service to honour God for giving him victory in the governorship election in which he got reelected for a second term in office. At the service which was held at Salvation Ministry Headquarters in Port Harcourt on Palm Sunday, Governor Wike said that his victory is for all Rivers people, hence it is a new beginning for the state. He added that despite the political turmoil, nobody lost during the elections. “Nobody has won and nobody has lost the elections. But Rivers State has won. “I forgive anyone that has wronged me and I also ask for forgiveness from those that I have wronged “. He said that he was in Church to give thanks to God for his faithfulness in the face of fierce political battles during the 2019 General Elections. “We have come here to give God thanks because he is so faithful to us. We have come to thank God for the fight he fought on our behalf. “It is only God who can fight for us. We have no power of our own to fight”. He noted thanked the Presiding Pastor of Salvation Ministry, Pastor David Ibiyeomie for his spiritual support during the long drawn political battle. 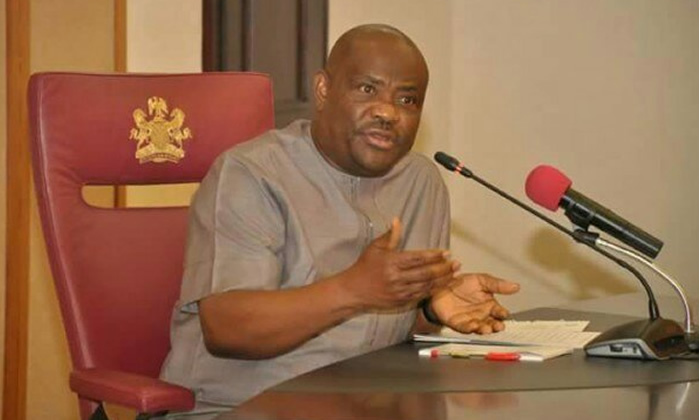 Governor Wike said even when he faltered in faith, he was strengthened by the cleric with his confidence restored. The Governor said that with what transpired during the long drawn political battle, it is obvious that truly Rivers is a Christian State. Speaking at the Thanksgiving Service, Senior Pastor of Salvation Ministry, Pastor David Ibiyeomie prayed God to accept the governor's Thanksgiving and bless him. He said by the Special Thanksgiving, God will perfect everything that concerns Governor Wike and his family. He decreed God's wisdom on Governor Wike. He said God will grant him the enablement to lead the State in the right direction. While praying for God's blessing on Governor Wike, Pastor Ibiyeomie said anyone planning evil against the Rivers State Governor will fall pray to his/her evil machinations.